Yellow onions, or yellow globe onions, are available for purchase year-round in most grocery stores and food markets. But these all-purpose yellow onions easily grow in the home garden, and store well for use during the winter months. Growing from sets is a fast way to raise a delicious crop of yellow onions. 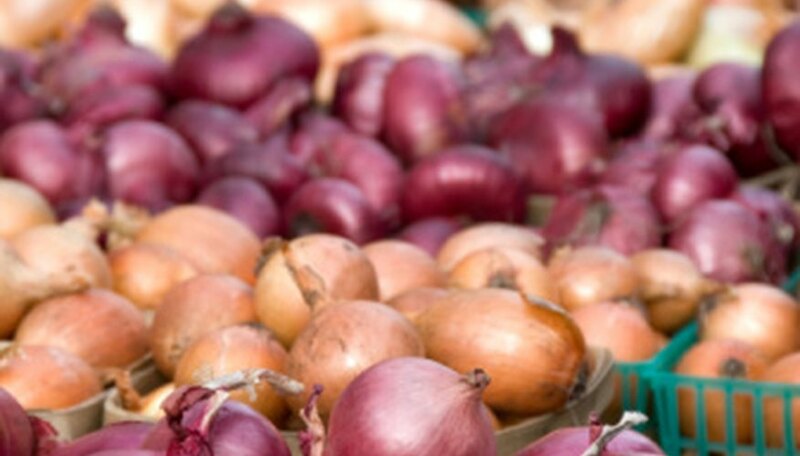 Onion sets are dormant onion bulbs that eliminate the need to spend weeks germinating onions seeds. Break up and loosen the garden soil to a depth of 12 inches with a rotary tiller. Remove any weeds, debris or rocks from the garden soil. Make sure your garden location receives at least six hours of sun per day and the last frost has passed before you plant. Incorporate 3 inches of aged manure into the garden soil, using a shovel. Use a rake to level the soil. Turn the shovel upside down and use the handle to make 1 1/2- to 2-inch-deep holes – spaced 4 inches apart – in the soil. Place one yellow onion set into each hole with the pointed end facing up. Rake soil over the yellow onion sets to cover, and pack the soil down gently with your hands. Water the yellow onion sets with a watering can until the soil is moist. Continue to water the yellow onions one to two times per week, maintaining a moist soil. Place a 2-inch layer of weed-free hay in the yellow onion garden bed to discourage weed growth. Weed-free hay does not contain any seeds that might grow into the soil after application. Weed the yellow onion garden bed regularly by hand to remove all competition for food and water. Feed the yellow onions a liquid, slow-release fertilizer about one month after the sets have sprouted above the soil. Refer to the fertilizer instructions on the quantity ratio. Stop giving the yellow onions water when the tops of the plants have turned brown and fallen over. Leave the yellow onions in the garden ground for up to one week without water. Push both hands into the soil on both sides of the yellow onion plant to raise the onions. Using your hands will prevent damage to the onions that can occur when using spades or other sharp instruments. Place the yellow onions on a screen to dry in a warm, protected location away from animals and harsh weather elements.